School of Nursing students, faculty and staff participated in the Gratitude in Action drive to benefit the emergency food pantry on campus. (NEW ALBANY, Ind. )—On Oct. 5, 1922, six nurses from the Indiana University Training School for Nurses in Indianapolis, Ind. founded an academic honor society. They named it Sigma Theta Tau, from the Greek words for “love, courage and honor.” Its mission was to advance world health and celebrate nursing excellence in scholarship, leadership and service. Now 94 years later, Sigma Theta Tau International (STTI) boasts 135,000 active members—students and nursing professionals—in 85 countries who are impacting lives in ways that few other professions can approach. Each year, members commemorate STTI Founders Day, Oct. 5, by donating 90 minutes of service as a volunteer at organizations that align with the society’s core ideals. 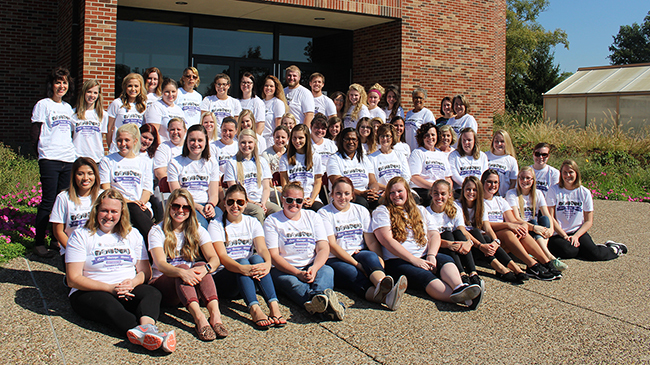 This year, to support STTI’s “Gratitude in Action” campaign, IU Southeast’s nursing students voted to honor Karen Richie, counselor/care manager in the Office of Personal Counseling, for her work in founding and overseeing the Grenadier Grab ‘N’ Go emergency food pantry on campus—exemplifying the ideal of service to community. Led by Pam White, lecturer in nursing and STTI representative on campus, and the Student Nurses Association (SNA), the faculty, staff and students donated food items collected over the past two weeks from the campus community, and distributed flyers to raise awareness of the pantry, and the problem of homelessness among students. 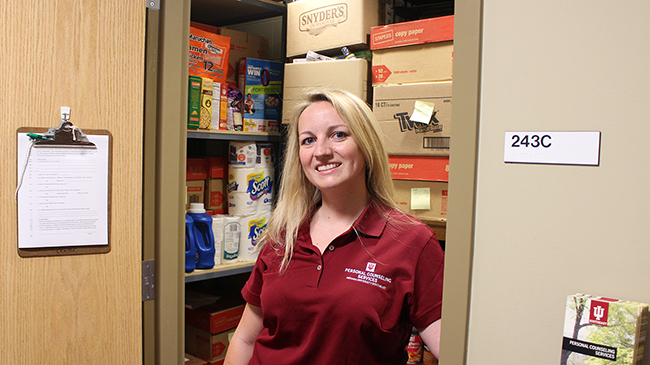 Karen Richie oversees the Grenadier Grab ‘N’ Go emergency food pantry. The idea for devoting service time to the pantry originated with Dean Donna Bowles, but according to White, it was the students to took that idea and ran with it. The emergency food pantry opened last year in UCS 243C, after groundwork by faculty and staff with a personal commitment to helping struggling and/or homeless students meet their basic needs. When Richie joined the staff, it was with the understanding that this would be part of her role, alongside counseling. With a background in social work, and broad knowledge of the resources available in the region, Richie led a small group from faculty, the Office of Student Life and Housing to develop the logistics for the pantry. The pantry dispenses boxes of food that provide a full range of breakfasts, lunches and dinners, as well as some fun treats and even non-food sundries. The boxes are not identifiable, preserving confidentiality for students who may not wish it known that they are receiving help. There is no need for students to demonstrate need. The process is streamlined and low-key. So far, the pantry has dispensed between 20 and 25 boxes to students in need, and many more individual items to those who just needed to bridge a gap. The “Gratitude in Action” drive brought a hefty haul of provisions to the pantry, and put information about the service into the hands of over 160 students who passed by the information table on McCullough Plaza. For Richie, the event demonstrates IU Southeast’s commitment to student success in more ways than one. Homepage photo: Nursing students deliver food and sundries to the Grenadier Grab ‘N’ Go emergency food pantry. Photo by Rachel Terlep.